Taste test: These are very good chips, combining a mild, sweet barbecue flavor with the excellent taste and great crunch of the underling thick-cut, dark, irregularly shape Kettle Chips. There were several impressively large chips included in the bag. The barbecue taste was hard to even notice near the top of the bag, but it got stronger as we got toward the bottom. There was no heat to these chips and no hot aftertaste. 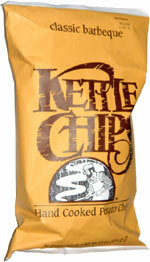 They were a big hit among the tasters who visted the chip bowl. Smell test: Very nice baked potato-type smell. No noticeable barbecue smell.